Reports are coming in about the use of chemical weapons (CW) near Aleppo in Syria. The source is the Syrian government, who alleges a rebel attack. Up to 25 people may have been killed; scores more injured. Russia confirms the reports in a strong-worded statement; the US denies the attacks, but is waiting for further analyses of the reports. The Director-General of the OPCW expressed his grave concern over the reports. I just saw images from a hospital, where a lot of people wearing surgical masks attend to people having infusions, on BBC World. Sana-Syria has published pictures. There are no images of the site of the attack; just of some affected people. These people do not show outward symptoms of a CW attack. Definitely not mustard; definitely not a nerve agent. There are far too many people, including non-medical staff, around the affected persons. Apart from a surgical mask, nobody wears any protective garment or gas masks. If there would have been a CW attack with one of the agents known (or believed) to be in Syria’s arsenal, then most of the people present would have been fatally or seriously contaminated. I am deeply sceptical of allegations that the insurgents would have resorted to CW. There would have far greater propaganda benefits if they were to demonstrate to the world that they had overrun one of the storage or production facilities. In addition, insurgent spokespersons were very quick to deny the government allegation. Regarding a case of a transfer to (and, hence, use by) surrogates of the Syrian government, I have already expressed my views on such a scenario. Present-day battlefields are extremely toxic. Many materials may be propelled into the air and inhaled by bystanders. If some (toxic) chemical container were hit by a shell, then bystanders could be badly affected, as we have seen in a variety of recent internal conflicts (former Yugoslavia; Sri Lanka; Iraq; etc.). Bhopal reminds us of the large-scale effects of an industrial accident. Any investigation of the allegation must first exclude plausible alternative explanations. Is the Syrian government allegation the type of statement often heard in the past to justify ‘retaliatory’ chemical attacks? If so, the next days and weeks may become very nasty indeed. Not just because of chemical warfare, but also because of the various red lines Western states, and the US in particular, have drawn if such an escalation with CW were to take place. Why has Moscow confirmed the Syrian allegation so quickly and in such strong words? What is the motive behind this? Just contradicting the West again? If not, why is it so tied to Bashar al-Assad? What can it gain from this position? Of course, Syria got most of the technology and expertise to set up and run its CW programme from the former Soviet Union. Did the former head of the Soviet CBW forces, Anatoly Kuntsevich, not die on his return from Syria in 2003? Furthermore, if Syria were ever to become a party to the CWC, it would have to declare the origins of its CW programme. Whatever we wish to believe, it potentially sets up Moscow against any country that might intervene militarily because of CW use. 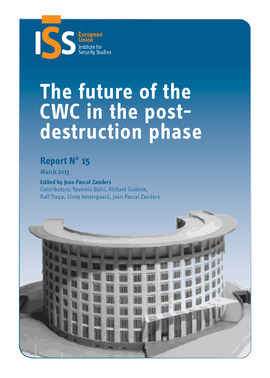 In three weeks time the States Parties to the CWC will convene for the 3rd Review Conference. Confirmation of the allegations or escalation described in the bullets above would have a most serious impact on the proceedings. Anyway, this is just a quick take on an unfolding story. I am sure to follow up if anything further happens.